Great American: A significant day for Virginia girls teams in putting the state on the national map for the 2009 cross country season as three of the top five teams in the Race of Champions were from the state in runner-up Blacksburg (116 pts), third place Midlothian (130 pts), and fifth place Hidden Valley (137 pts). Octoberfest: The top ranked boys individual and team in Group AAA went down at Great Meadow with Centreville's Yazid Zouaimia and the Mountain View boys (pictured left by Nicoll Knudsen) defeating #1 ranked Kevin Dowd of Fairfax and the Grassfield boys. Kaitlyn Davis and Katherine Walker had a great Northwest Region duel with Davis picking up the win. West Potomac girls won by a wide margin. Results from elsewhere: Andrew McCullen and the Oakton boys had very impressive 2nd place finishes at Wendy's with McCullen (pictured by Ken Charnock, LandsharkPhotos.com) losing the individual title at the line with VA's fastest 5K time of 15:18. At the flrunners.com Invitational, the Lake Braddock girls take second place honors in the Race of Champions behind Winter Park of Florida with 114 points. In Greensboro, the Lee-Davis girls repeated as team champions at the Hagan Stone Park Classic with 3 runners among the top 5. October 3rd is apparently the weekend to travel for many Virginia schools as you will see teams in action this weekend in several meets spread throughout the East Coast in North Carolina, Delaware, and Florida. The Octoberfest Invitational appears to be virtually the only game in town on this weekend in Virginia with well over 3,000 runners expected to converge at Great Meadow on Saturday. The revival of Great American and return to North Carolina is seen with several of the state's NXN hopefuls previewing the regional course in the Race of Champions. Other teams have skipped out on Great American and are seeking competition in other out-of-state meets including Northern Region schools Lake Braddock at flrunners.com Invite (FL), Oakton at Wendy's Invite (NC), and West Springfield at Salesianum Invite (DE). What a weekend to finally see how most of the top teams stack up. ArmoryTrack.com was onsite at the McQuaid Invitational and the St. Anthony's Invitational. Photos coming from both and videos coming from McQuaid. North Shore’s Samantha Nadel is up and running after a strange and scary fall Saturday. News from North Carolina and a continuing HUGE day for Florida!! 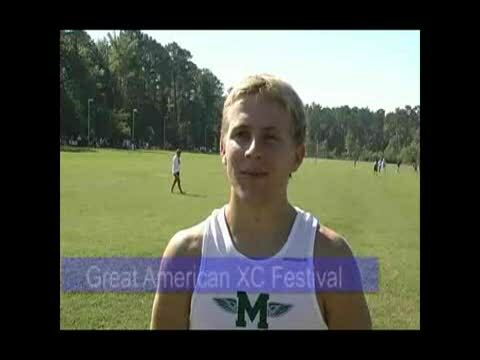 Brian Atksinson has won the elite race at Great American in Cary, NC with a time of 15:13. That time was five second better than Footlocker Nationals finalist Clint McKelvey of Tennessee. Teammate Erik Fagan finished 43rd in 16:26. PKY girls were 4th in the Seeded. Holy Trinity boys were 6th in the Seeded--without David Kilgore (raced individually in ROC, 15:57). BK, Holy Trinity, and Bolles girls were 14th, 16th, 17th in the ROC. Holy Trinity girls JV was 2nd to Saratoga Springs. So much attention has been keyed on Florida's largest race of the year (FLR 10) that burried on the front page now is a huge story. So let's give Brian Atkinson his due! This past weekend he traveled to North Carolina for Great American and won their version of the Race of Champions against national-level competition on a relatievly difficult course with a time of 15:18. Barry Jones was on site for flrunners and took hundreds of photos and did a video interview with Atkinson. MileSplit's national team also did some great coverage and has full results, tons more photos, and commentary on the Great American meet page. As a result of his victory there, Brian now finds himself ranked 16th in the latest MileSplit National Individual Rankings. Congrats, Brian! Sophomore Mary Kate DuBard's second-place run propelled the Georgia Tech women's cross country team to second at the Great American Cross Country Festival Friday in Cary, N.C. The Tech men placed third at the WakeMed Soccer Park. Interview with race footage of Boys Race of Champions winner Brian Atkinson.